BALTIMORE, Md., Dec. 10 (SEND2PRESS NEWSWIRE) — LMXMEDIA, a California-based video production, advertising and PR company, announced the official release of “Raymond Berry’s Receiving Fundamentals” DVD (a 2 disc set). This is the first DVD of its kind in the sports instructional and entertainment industry. 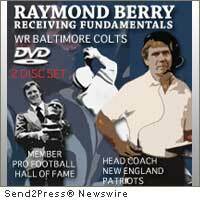 Raymond Berry’s Receiving Fundamentals DVDs provide Baltimore Colts and general football fans with a look into the specifics of the legendary combination of Johnny Unitas to Raymond Berry. Coaches, fans and players here is your chance to learn from one of the most accomplished NFL players and coaches the game has ever seen – Raymond Berry. His Receiving Fundamentals DVDs break down the main jobs a receiver must master. This DVD set provides an educational, entertaining and inspirational way to learn the essence of the wide receiver position. The Raymond Berry story is one of determination, dedication and desire. Berry, who needed to wear special shoes because one leg was shorter than the other, didn’t become a starter on his high school football team until his senior year, even though his father was the coach. As an end for Southern Methodist University, he caught all of 33 passes in three seasons. Why the Baltimore Colts selected him as a “future choice” in the 20th round of the 1954 draft, is a mystery. A long shot to make the Colts, Berry was determined. He practiced constantly, refining his routes and catching passes from anyone willing to throw to him (including his wife Sally). Even though Berry had just average speed, he developed by his own count, 88 different moves to get open. In 1956, Johnny Unitas became the Colts’ quarterback and Raymond was ready to put all his hours of practice to use. Together the two gave the Baltimore Colts one of the greatest pass-catch teams of all time. Over three straight seasons Raymond led the league in receptions. He caught a then-record 631 passes for 9,275 yards and 68 touchdowns and only 1 fumble in his 13-year career. A first or second team All-Pro choice from 1957 through 1961 and again in 1965, Berry was selected to play in six Pro Bowl games during his career. Perhaps his greatest moment came in the 1958 NFL Championship Game, commonly referred to as the greatest game ever played, where he set a then record with 12 catches for 178 yards and a touchdown. Several of his receptions came during the Colts last minute drive to the tying touchdown. In overtime Berry had two receptions for 33 yards and were the major gains in Baltimore’s drive for the winning score. DISC 1: Explains Raymond’s Routes. These are the patterns he used with legendary quarterback Johnny Unitas. Watch Berry run the routes in color film in practice with an isolated camera on him. These patterns are great versus man-to-man defense (and are effective against zone also) and incorporate a balanced approach at attacking a defense (inside, outside, short, medium, long). In addition, moves and counter moves are explained in detail. Berry always had a complementary pattern ready to throw at the defense in the on going chess match of one-on-one coverage. DISC 2: Raymond Berry’s 18 catching drills in 30 minutes. These are the daily drills Raymond practiced. They represent the most difficult types of catches a receiver must master. Then watch the famed Unitas to Berry combo in action. Both discs include exclusive practice film and game shots. Raymond Berry’s Receiving Fundamentals DVD is available at http://www.raymondberry.com . On sale for $29.95. More information and to view a preview: http://raymondberry.com/Buy_the_DVD.html . Based in Westlake Village, California, LMXMEDIA has been working with small-to-medium sized businesses with video production and advertising, establishing their brand and growth revenue since 1999. LMXMEDIA has produced numerous DVDs, live events, and web video solutions for Internet marketing, since 1995 including the Heisman Trophy Trust™. Original Keywords: Maryland Newswire, Baltimore, DVD, sports, raymond berry, baltimore colts, hall of fame, nfl, johnny unitas, football fundamentals, greatest game ever played, LMXmedia California LMXMEDIA Baltimore Maryland BALTIMORE, Md. REFERENCES: Baltimore Business News, Maryland Newswire, Baltimore, DVD, sports, raymond berry, baltimore colts, hall of fame, nfl, johnny unitas, football fundamentals, greatest game ever played, LMXmedia California LMXMEDIA Baltimore Maryland BALTIMORE, Md.